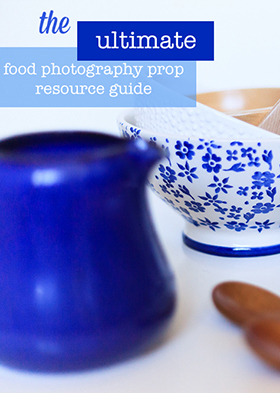 We talk a lot about food photography and food styling in the food blogging world. I think we’re sort of obsessed with it. I know I am! Ages ago I wrote about a post asking if food bloggers were caught in a rut with their food photography? It got a LOT of feedback. Haha! I think because most of us aren’t professional photographers and because photography can have a pretty steep learning curve (actually… scrap that… what it has is a steep practice curve), we tend to find something that works, that we can execute easily and we stick with it. Especially when we’re in a hurry to get food on the table! I know I’m guilty of falling into this trap. I don’t experiment nearly as much as I used to when I first started out. And my photography has suffered for it. I think when we experiment our mindset is different – we kinda know we’re probably going to screw up or that what we’re trying could turn out to be a big disaster and we’re ok with that – we’ll just try something else if it doesn’t work. And that pushes our creativity. But when we stop experimenting, we stop being creative. We get formulaic and just put together a setup we know will work. That doesn’t mean it won’t look nice. It will. But it won’t be inspired, or different, or push the envelope creatively or force us to expand our skills. One of my favourite things to do is curl up in a big comfy chair with a cup of tea and browse a magazine. It’s… chill time, you know? Way back when I worked in retail, we were allowed to take magazines from the checkout racks and read them on our lunch and coffee breaks. Magazine delivery day was Tuesday so we’d all start off reading the weekly tabloids – The Star, The Enquirer (I know… don’t judge – they’re incredibly entertaining). Then People and US. After exhausting the weeklies we’d move on to the monthlies – whatever our interests were. I was always read the home design and food magazines. A spread inside Victoria is full of Valentine’s inspiration – Victorian themed but with a modern edge. A style I’m liking more and more. Fast forward to when I worked in an office – me and my cube mate would forgo the staff lunch room and head to Starbucks at lunch hour with our magazines and drink a hot bevvie. By this point in time the magazine selection out there was much much bigger and I could easily get my hands on art, photography, graphic design, and a much wider variety of food magazines. I would literally take my shoes off and sit cross legged (in my office clothes) in a big comfy Starbucks chair with my magazine resting on my lap, elbows on my knees, bent over reading. Best. Part. Of. My. Day. It was a nice break from reality but at the same time, it was inspiring. By this point I had just finished my design qualification and was already moonlighting as a freelance designer so I soaked up inspiration and new ideas like a sponge. I wanted to try things out, I wanted to learn new techniques, I wanted to make them mine! And there was something about flipping pages, while sipping a tea that was soothing yet captivating. The irony is, now that I work for myself, there are no scheduled lunch or coffee breaks. Instead, lunch is eaten while doing social media. Tea is a short trip to the kitchen and back to my desk to keep going. And my brain is so conditioned to browsing magazines during “non work time” that I find it really hard to allow myself to take an hour out of my day to flip through magazines or cookbooks (and yet… I have no problem letting myself surf the web for an hour looking at puppy videos!). So that has to change – I have to remind myself that food trends, food styling, food photography, food blogging and designing food blogs… are my job and I need to stay current! Because, the print world is full of inspiration! 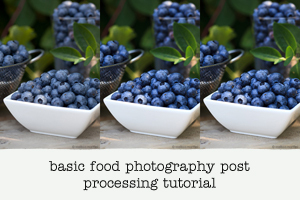 And if you’re a food blogger, a food stylist or food photographer, there are so many places to look in the print world – and not just in Bon Appetit or Saveur, or other food magazines. This magazine on using vintage and flea market finds to decorate is full of styling ideas and the colour pallet pullouts are invaluable to help with styling! So I thought today I’d share a few of my favourite publications to check out regularly. Martha Stewart Living – one of my girlfriends sends me a gift subscription every year and I love it – not just for the recipes but for the food photography. It’s simple, clean and beautiful. Plus, I find as a designer, Living is usually right on trend or just ahead of it with colour palettes, textures and typefaces. Victoria – this magazine isn’t really my personal style, which tends to be very clean and simple. It’s very… Victorian! The photos and styling are very feminine and about as opposite from the hipster vibe so prevalent at the moment. And yet it’s beautiful and actually quite, refreshing – almost calming and I like to lose myself in it and often use the colour palettes for inspiration. 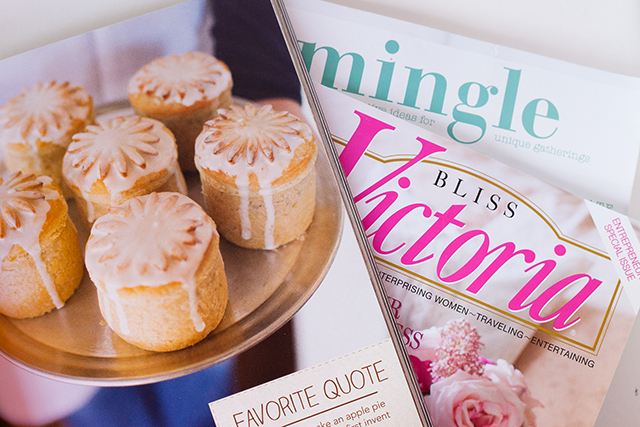 Mingle – I love this magazine for it’s styling and propping. 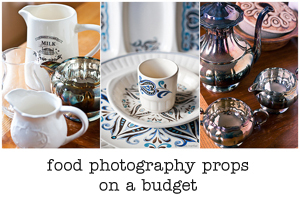 The focus is far less on food and more on entertaining so it’s a great publication to get inspiration for place settings and displaying food. Specialty Publications – publications like Better Homes and Gardens often put out specialty issues on things like flea market finds, decorating with vintage finds, etc. These are great because while they usually have nothing to do with food, they’re goldmines for styling and propping ideas. 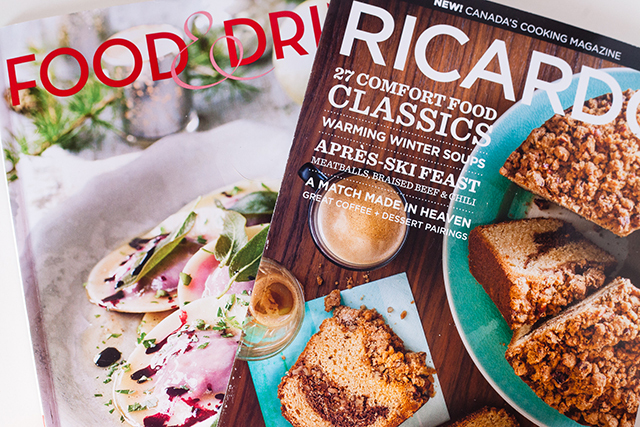 Ricardo and Food & Drink – these two magazines are for my Canadian readers. 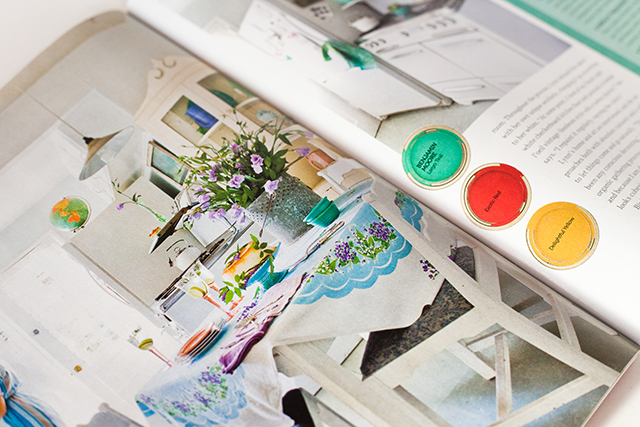 Ricardo’s new English language publication is beautiful – love the recipes but I also love the styling. And Food & Drink is the in house magazine of the LCBO. It’s stunning, on trend, beautifully photographed (especially cocktails and spirits – which I love) and get this… it’s free!! I pick up a copy every time I’m in Ontario and I have Ontario friends bring me a copy whenever they come to visit. I managed to pick up a copy of their holiday issue last month while in Toronto and it was just packed with seasonal ideas. The BCLC also has a free food and drink magazine which is great but just… not quite… there. If I kept all of the magazines I buy and read, I’d be lost somewhere under a pile of toppled magazines. So instead I do a designer trick and keep a tear out file. Anytime I see a photo that speaks to me, either because of the colours, the styling, the propping, or the overall photo, I rip it out and put it in a file folder. Keeps me from having to be a hoarder! I keep a tear out file of pages from magazines. 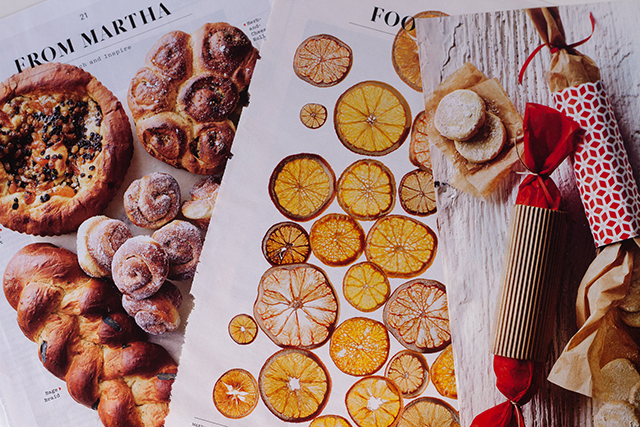 Like these bread and citrus spreads from Martha Stewart Living and a these great ideas for styling cookies from… my Airmiles magazine! 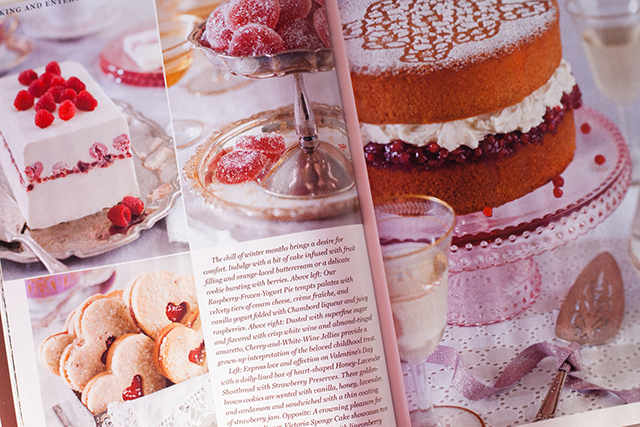 I also have a few cookbooks that I go to for the photography and the styling ideas as much as I do for the recipes. Anything by Donna Hay. The Donna Hay magazine is also beautiful but can be a bit difficult to track down in Canada. But I make up for it by drooling over her cookbooks. So simple and they show the art of photographing with a single colour palette. Beautiful. Butter Baked Goods. I love the Butter Baked Cafe here in Vancouver and I love her cookbook just as much. The photography by Janis Nicolay is stunning (and I had the pleasure of meeting Janis when she helped us out at FBC 2014 with our photography workshop. The photography even inspired a whole post on post processing. The Whitewater Cooks series. These books always make me feel like i want to eat outside. Even in the middle of winter. They are beautifully styled, photographed and feel so light and like I need to dive into the pages. The Messy Baker – Charmian’s cookbook was photographed by one of my favourite Canadian food photographers who’s work I have long been following in Canadian Living and Chatelaine, Ryan Szulc. The Happy Baker – I do a lot of cookie posts and I’m always looking for new ways to photograph a cookie. I love this cookbook for so many reasons but the styling and the photography are so fun and whimsical and I always feel inspired after flipping through it! 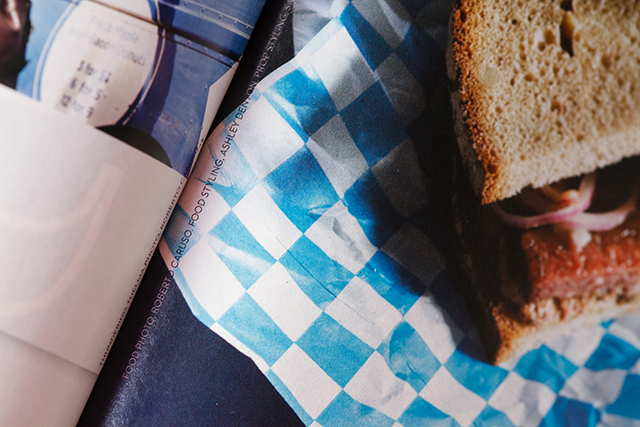 Here’s a little tip… if you’re flipping through magazines and something catches your eye, flatten the magazine as much as possible. Usually the photo, styling and propping credits are hidden right up against the spine, as you can see in the above image. I do this all the time and I find I’m often drawn to the work of the same handful of photographer and stylists. Then I’ll google them to find more of their work to enjoy! So don’t forget to take some time out to browse a few magazines in and out of the food world to get some inspiration. They’re usually where you’ll spot the newest trends and colour palettes. What are your favourite publications to go to for some inspiration? Magazine reading, especially food and home decor ones are a favourite past-time of mine though I tend to want to cook/bake/build/decorate whatever catches my eye in them. Nice tip about how to find the photography credits in some of them. This post serves as a great reminder that there’s a lot of inspiration for us food bloggers outside our narrow world. My roomie at FBC2014 and I talked a lot about design, and she really opened my eyes to looking for design ideas in a wider range of sources. I really appreciate your take on this, and the practical tips like looking for the credits on magazine photos. Thank you! I even grab the free magazines from Longo’s for food inspiration, to be honest! We usually go to print books with good food photography. We can either buy some books at bookstores or just browse through them. We also tend to look a lot for publications like Savoir, Canadian living, Chatelaine. 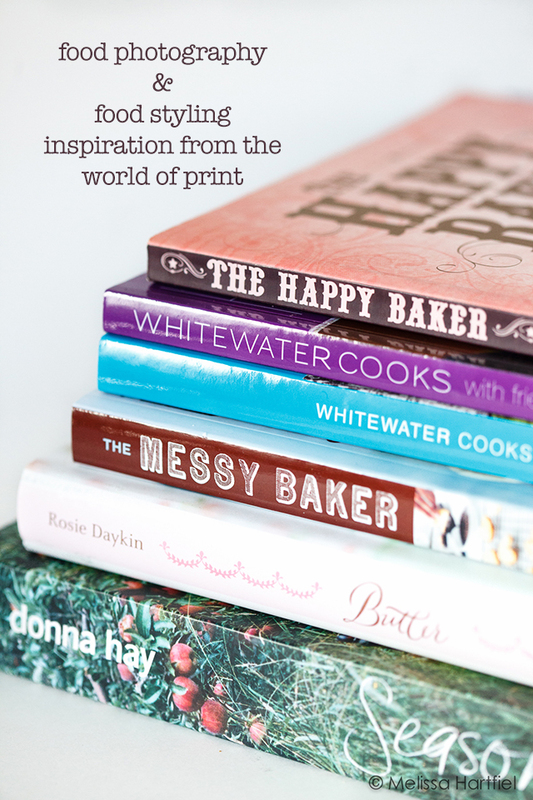 I agree that anything Donna Hay is inspiring. And the LCBO magazine is one of my favourite treats. But I need to get my hands on Where Women Cook. I’ve heard great things about it! Thanks for this, Melissa. Love looking through food magazines. Whenever I’m doing a recipe for the blog, I try to think about the whole story. I guess that’s the decorator coming out in me too! Love this post! I’m always looking for new places to look for food photo inspo, not sure how I didn’t think to look through magazines! I spend so much time perusing food photography, it’s one of my favourite hobbies haha! 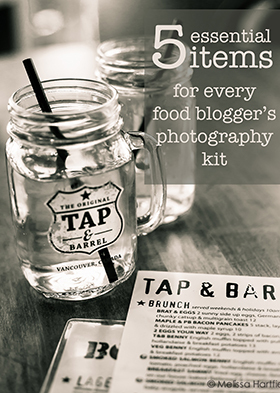 I am a brand new member of Food Bloggers of Canada and thoroughly enjoying it. Great article.I have a separate folder of beautiful food photos from magazines. Love Chatelaine and Ricardo.